One of the latest additions in the nationwide chain, in Yachats, on a foggy afternoon last week. 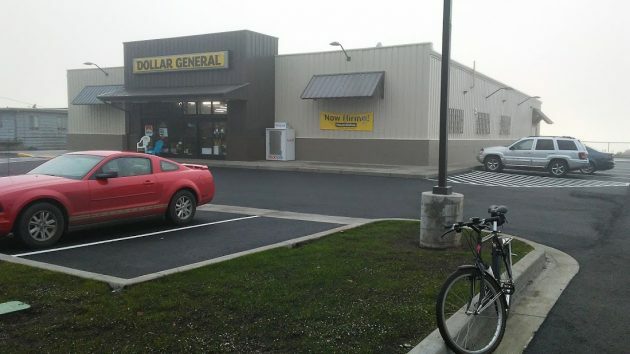 Every time you turn around in Oregon now, a new little “Dollar General” store pops up. This one in Yachats appeared within the past few months, about the same time as other outlets in the chain opened in Philomath and Waldport. I had never heard of this company until I started seeing signs with its name at construction sites a year or two ago. 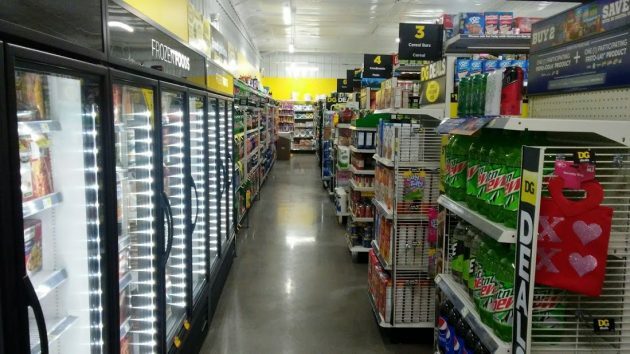 Which is a little surprising, considering that various papers (the Stayton Mail, the Portland Journal of Commerce and the Corvallis Gazette-Times among others, probably) had printed stories about Dollar General’s expansion in Oregon over the last year. From what I could tell, the stores feature a wide variety of household goods and a limited selection of food items too. They’re nothing like a supermarket, but they’re bigger than your average convenience store. This chain of variety stores has its headquarters in Goodlettsville, Tenn., population about 17,000. The company seems to favor small towns. In Oregon it now has stores in more than two dozen cities from Brookings to Winston and, as I said, Yachats, population about 800 when the tourists are gone. In the mid-valley, Jefferson has a relatively new Dollar General, and so do Sweet Home and Mill City. Lots of stuff lines the aisles of the new Dollar General in Yachats. The “Dollar Something-or-others” are so generic that I’m not sure of the name of the two I’ve shopped in Corvallis from time to time the last decade. Their food items make up an even unhealthier selection than Bimart’s. Some items are a better deal than at Winco, like nasty chemicals to fix drain and cleaning problems. Some items strain all credibility about how they can be made, shipped, and sold for a dollar, like radios. Everything is not a dollar they simply have every item rounded to the closest dollar. Dollar General has had a store in Harrisburg for about two years and, on the occasions we have been through, seem to be busy. There is one in Harrisburg also. I travel in the SE United States quite allot and they are everywhere in the South. I honestly have never set foot in one. Have you seen the one under construction in Brownsville? I realize that large corporations have but limited interest in aesthetics, but as someone who has to frequently drive past a new Dollar General store, I can’t help but wish that they could have adjusted the design of this store to somehow fit in–at least a little bit– with the nature of my community. This is a fairly ugly building. Wait. The real news is that a new business is opening in staid Yachats. Businesses have been leaving for many years. Sounds like the New Age affect of the village finally wore out. They’re the place you go for generic party supplies and other items like cheap tools when you don’t need “good” items but “good enough” will do.